Rabbi Levi and Bassie Shemtov founded the Friendship Circle in 1994. The votes are in, and the five individuals who could be revealed as the No. 1 hero of North American Jews include a woman who ensures that thousands of needy brides and grooms have the best wedding possible; a comedian whose non-profit has delivered some 21,000 meals to the hungry in just two years; a rabbinical student trying to institute ethical oversight of kosher businesses; a blogging rabbi behind one of the largest Jewish college festivals; and a Chabad-Lubavitch emissary who founded the Friendship Circle, a program dedicated to changing the way society interacts with children with special needs. Officials with the Jewish Community Heroes contest announced the finalists via e-mail, the contest’s Web site, and a YouTube video. Each of the contenders will receive $1,000 for their charities during this weekend’s General Assembly, the annual gathering of the umbrella organization representing North American Jewish community. The winner, who will receive a $25,000 prize, will be announced during a Nov. 9 ceremony at the conference in Washington, D.C. In the video posted on the contest’s Web site, the finalists each take about 35 seconds to introduce themselves and their work. 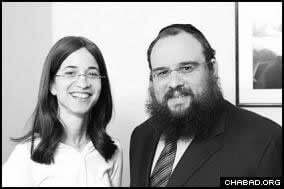 For his part, Rabbi Levi Shemtov, a recipient of a Manhattan Institute Award for Social Entrepreneurship, quickly outlines the growth of the Friendship Circle, which he and his wife Bassie Shemtov founded in 1994. Joining Shemtov and Benjamin as finalists is Ari Teman, founder of JCorps, Shmuly Yanklowitz, founder of Uri L’Tzedek, and Rabbi Yonah Bookstein of Jewlicious. Organized by United Jewish Communities, whose board recently decided to change its name to Jewish Federations of North America, the contest asked rank-and-file Jews to nomine individuals who have positively affected the lives of others. By the time nominations closed in late September, more than 440 people had been nominated and more than 500,000 online votes had been tabulated.